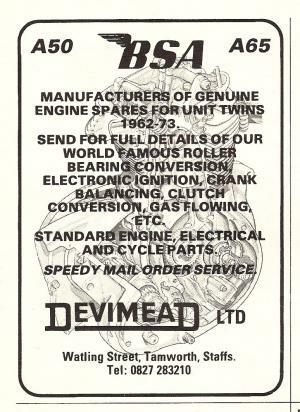 If you had an interest in the BSA A50 & A65 anytime from the early 1970s onward then the name Devimead will be a familiar one. Originally founded by LES MASON the company was eventually sold to SRM in the mid 1980s. So why bring DEVIMEAD back to life? DEVIMEAD is an anagram derived from DEVelopments In Motorcycle Engineering And Design and it is this mission statement that we are hoping to revive. The Company was founded, in the early 1970s, by LES MASON who was an ex-BSA employee. During his time at BSA he had access to the modifications and special parts that were developed in the competition shop - officially for the 'works' race bikes and un-officially by the employees who raced at the weekend! 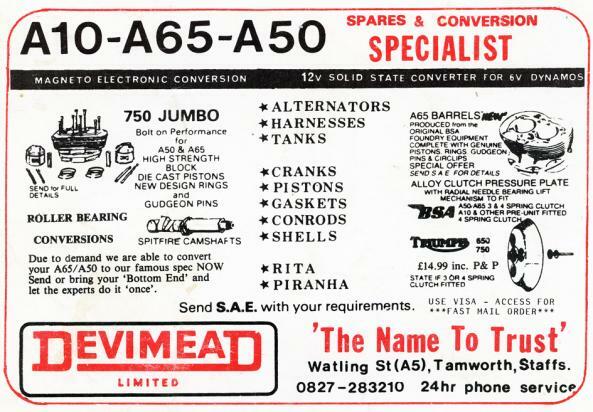 Devimead was the first company to offer the Needle roller conversion to the public and many other products to enhance the performance and reliability of the A50 and A65. The Company developed through the 1970s and 1980s and with the decline of British motorcycles became firstly a MORINI dealer and later a 5 STAR HONDA dealer. 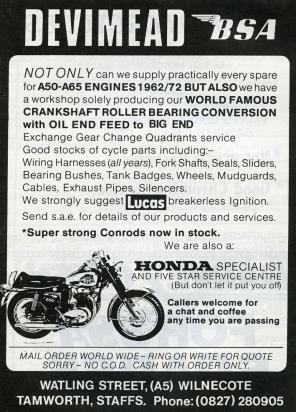 However there was always a corner in the business that was devoted to BSA. DEVIMEAD supplied lots of racing 'goodies' for not only the sidecar racers but the solos too. 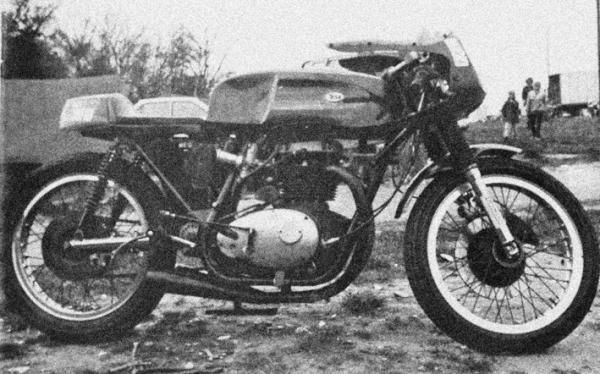 DEVIMEAD also ran a couple of their own race bikes, initally with a modified BSA racing frame (from the A50 Daytona racer) and then with a special frame inspired by the EGLI frame. At one point the Company hoped to produce a DEVIMEAD bike using this frame and a 750cc BSA engine. Since acquiring DEVIMEAD we have been looking for ways to carry on the good work and whilst SRM have taken over many of the services and products that were once produced by DEVIMEAD the NEW DEVIMEAD is about developement and new products to improve performance and reliability for Unit BSA twins. If you would like to sign up for the SRM EShot which contains information about recent innovations in Classic Bike Restoration and information about new products. Copyright © SRM Classic Bikes, 2014-2019.